I fondly remember the gooseberry jams and crumbles that my grandma used to make. These delicious tart little berries are just perfect for making preserves and fruit desserts but can also be used for making cooking sauces for poultry dishes or dips. But did you know how healthy these unique little berries were? If you would like to find out why we think you should be adding gooseberries to your diet, this article may just convince you. Gooseberries are small, firm translucent fruits which grow wild on smallish, thorny bushes in various parts of the world. Originating in Europe, gooseberries were cultivated in Africa and Asia before the British started to cultivate newer varieties in around the 16th century. Although there are many cultivars, there are actually just two main types of gooseberry. The European gooseberry scientifically known as Ribes uva-crispa is larger and according to many people tastier than its American counterpart. Gooseberries are a hardy fruit that can thrive in extreme conditions from hot humid summers to freezing cold winters. In North America, you can pick fresh gooseberries in July and August when they are typically ripe and ready for the picking. Gooseberries are an extremely healthy fruit, they are free of cholesterol and contain few calories. They are a great source of vitamins A and C and some of the B family of vitamins like thiamine and folate. They also contain various minerals like manganese, potassium, calcium and iron. Gooseberries are an excellent source of dietary fiber which can help reduce various digestive complaints, the risk of disease and help promote weight loss. Interestingly, in view of the fact that fresh gooseberries are only available for brief periods of the year, canned gooseberries have a similar nutritional value as the fresh variety. This means that you can enjoy gooseberries the year round safe in the knowledge that you are not losing pout on their wide range of excellent nutrition and health benefits. Gooseberries are a great source of Vitamin C. In fact, a one cup serving contains over 41 milligrams of the vitamin which represents a whopping 55% of a woman’s recommended daily quota and around 46% for a male. Why is this significant? Vitamin C is a natural antioxidant meaning that it helps to prevent damage caused by environmental free radicals. This free radical damage is almost impossible to avoid but it has a devastating impact on the cells and the DNA so it is important to counteract the damage by getting as many antioxidants into our systems as we can. Vitamin C is also necessary for the synthesis of collagen and contributes to the health of our skin, teeth and bones. A diet rich in vitamin C can also reduce the risk of heart disease, hypertension, osteoarthritis and even cancer. To ensure that you get the best possible vitamin value from your fruit, store the gooseberries in a cool and dark area and eat them within a few days. 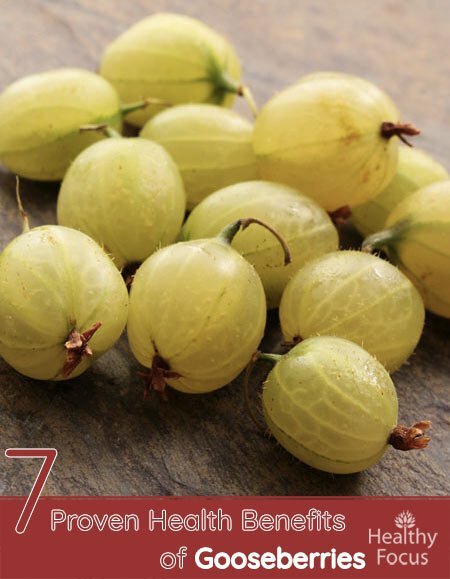 A one cup serving of delicious fresh gooseberries contains around 18% of your recommended daily vitamin A allowance. The vitamin A contained in gooseberries is in the form of carotenoids. These compounds also have antioxidant properties that may help protect against various diseases including heart disease, neural degeneration and diabetes. The vitamin A found in abundance in gooseberries is also known to guard against age-related eye disease, stimulate the production of red blood cells and regulate the genes. Gooseberries are also an excellent source of essential dietary fibers. Each one cup serving of the fruit contains around 26% of the amount of fiber that you are advised to get each day. Like most other berries, gooseberries contain both soluble fiber and insoluble fiber. Increasing your intake of the soluble fiber found in gooseberries is linked to a reduced risk of developing high cholesterol and diabetes. Getting more insoluble fiber into your diet helps take care of many digestive complaints and improves overall digestive health. It is known to effectively help treat and prevent constipation, diarrhea, cramps and bloating while it may also reduce the risk of colon cancer and hemorrhoids. Studies into the benefits of fiber have even demonstrated that adding more to your diets can help prevent heart disease and reduce blood pressure. Being rich in various antioxidants, gooseberries can help protect your heart from the oxidative stress that commonly leads to heart disease, stroke and high blood pressure. Gooseberries contain high amounts of several minerals that are essential for the body’s health. They contain a good amount of potassium which helps the muscles and nervous system work effectively. Potassium is also good for the heart as it helps maintain blood pressure at healthy levels and prevents abnormal heartbeat. People who are deficient on potassium are at an increased risk of osteoporosis, hypertension and stroke. A cup of fresh gooseberries also provides you with around 12% of your recommended daily dose of manganese. Manganese is essential for many reasons including the metabolism of energy, regulating blood sugar and promoting calcium absorption. People who are deficient in manganese are at a higher risk of osteoporosis, diabetes and arthritis while women are more likely to experience premenstrual symptoms. The iron found in gooseberries helps to promote the regeneration of red blood cells and promotes proper blood circulation. blood regeneration. Like all berries, gooseberries are very high in antioxidants which help protect against cellular damage and oxidative stress. This antioxidant action plays a major role when it comes to brain health and cognitive functions such as improved memory. Getting older is inevitable and the signs of life will eventually creep up on us. Thankfully however we do not need to take it lying down. We can at least maintain a youthful appearance for longer by adding the right type of antioxidant rich food to our diet. As we have already mentioned, gooseberries have a high antioxidant value which means they are excellent for our internal health. But not only do free radicals damage our insides, they also have a significant effect on our appearance making many people look old before their time. Eating gooseberries and other antioxidant rich food can slow down this inevitable process and may even help reverse some of the signs by clearing up wrinkles and other age marks on the skin. Now that you know just how good they are for you, let’s take a look at some of the ways you can add this fruit to your diet. Early season gooseberries tend to be firmer and better for cooking but fresh gooseberries taste best when they are perfectly ripe. Ripe gooseberries are sweeter making them a great addition to a fruit salad or simply enjoyed from the hand. Gooseberries can be used to make any number of desserts. They do nit require much preparation and often appear in desert dishes like gooseberry fool, crumbles, pies or as a cheesecake topping. You can use them on their own or combine them with some of your other favorite fruits. Gooseberries make a great fruit for a jam or chutney whether used alone or combined with other fruits. Gooseberries can be used as the main ingredient in a sauce to serve up with a meat or poultry dish. A gooseberry sauce is easy to make combined with herbs and sugar so give it a go and let us know how it turned out.